Hanging Mushroom on Steel Wire Marsha Neal Studio. I’ve been thinking of how I want to photograph and market these small hanging sculptures. Marsha Neal Studio Suspended Mushroom on steel wire. Now to go and see how it looks in my Etsy shop and if it will make it into any treasury collections. As a bit of Thanks for all of my customers – I am offering a lot of items in my Marsha Neal Studio Etsy shop at sale prices through Dec. 2, 2013. For Black Friday through Cyber Monday to take advantage of the marketing that goes on during this weekend that kicks off the holiday shopping season, I am offering an extra 10% off sale and regular priced items when you enter coupon code: Thanks10 into your cart when you are checking out of my Etsy shop – until the end of the day on Dec. 2, 2013. Hoping these extra discounts help your holiday project budget go a bit further this year! Thank you for your continued support of my work!!! 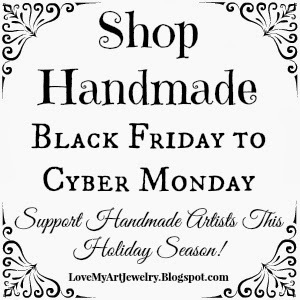 And while you are clicking and cruising around, make sure to check out a lot of Handmade Artists that are also offering specials over this weekend (may not be every day – so read their shop announcements! ).